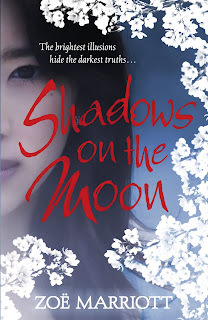 Our October book is Shadows on the Moon by Zoe Marriott. We gave it 3, 4, 4.5 and one 5 star, so I'll average that out to 4 stars. I really loved this book and so did a couple of others. A few of us hadn't finished it yet, but were enjoying it. One of us just couldn't get into it and one other had only read the first word! lol So it was quite a mixed bag! We all agreed that we loved the style of Zoe's writing. A few of us were surprised to learn that this was only Zoe's second book! One thing that a few were in agreement on was that a glossary would have been helpful, as there were a lot of unfamiliar terms that held up the reading at times. 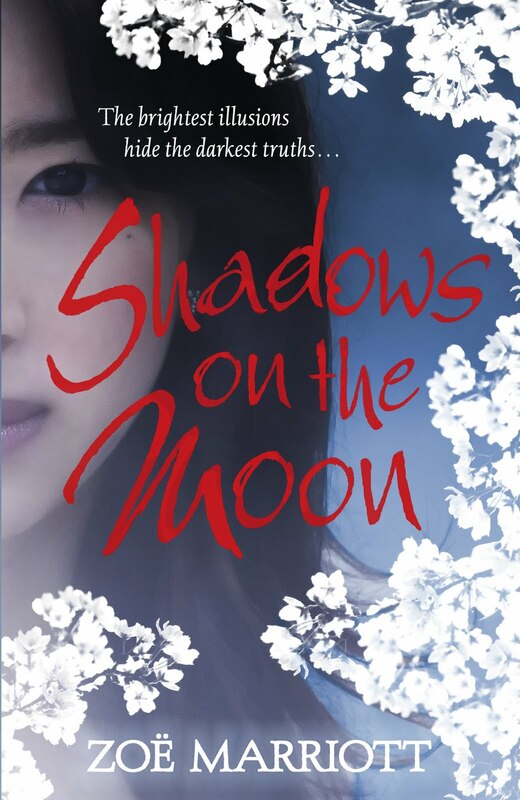 This book is set in a Japanese culture, so that presented a few problems, because they didn't know what some of the names of things were and couldn't imagine some of the items being talked about, the clothing for example. This isn't a big problem in itself, but it was enough to interrupt the flow at times. We loved the darker side of this book too. We thought that Zoe was very brave to have tackled the subject of cutting, and we think she did a brilliant job with it. We got to see Suzume's reasons for it, and what drove her to do it. It was treated with respect and was realistic. It is still quite a taboo subject, so we take our collective hat off to Zoe for putting it out there. Which leads us on nicely to our next point! lol Zoe writes great characters! She also does some awful stuff to them!! In alot of books, you know everything will be OK in the end, everyone wants a happy ending don't they? Well, with Suzume you're never sure what's going to happen next. One of the members was about two thirds of the way through the book, and she couldn't see how it was going to end well. This character had already been through so much and there was no happy ending obviously in sight and she thought that was brilliant! This story is not predictable, and the emotional journey you travel whilst reading it is a long one, with many ups and downs. Zoe knows her characters well and isn't afraid to challenge them, or just kill them off completely! We found it a refreshing change from some of the more formulaic books. We talked a bit about the Cinderella references too. We liked the evil step-father in place of the step-mother, and that Suzume's prince charming was in fact not the prince. We didn't really notice the references to the Cinderella story until the end of the book, which was good, as it could have been a bit distracting. On the whole we agreed it was an interesting take on the classic tale, with lots of twists and turns and emotion. Personally, I loved this book! I think I might right a seperate review in a few weeks for it. We managed to make a few plans for the next few months too. November's book is Blood Red Road by Moira Young, and that meeting will be on 8th November. Keep an eye out for a post about that soon. Also we talked about our plans for December. We have some very special posts coming over the Christmas period, written by each of the members. I'm very excited about this! :D Oh I nearly forgot, we will be doing a secret Santa in December too! !